Faye Matthews-Castelli cools off a pet cockatiel saved in the 49 Fire with water from a hose as husband, Joe, looks on last week. The two lost nearly everything in the 49 Fire and continue to have concerns about how things were handled by emergency personnel and fears about future fire danger. In the dream, 49 Fire victim William McReynolds comes back to his charred North Auburn neighborhood again and stands alone to face homes that have been reduced to ashes. McReynolds, 78, lost his house and nearly everything else in the Aug. 30, 2009, fire and has since rebuilt on the site. But the dream – a nightmare really – continues. And his life during his waking hours has been equally as difficult. McReynolds said he learned that he had leukemia soon after the fire. His wife lost two brothers in the past year and a son from his first marriage died. An infected gall bladder required removal and before the operation, doctors found he had heart disease and inserted two stents. On some nights, McReynolds wakes up in a cold sweat with visions of the aftermath of the 49 Fire clouding his mind. He can’t sleep and is up awake for hours afterward, thinking about the fire. “It just doesn’t seem to quit – it doesn’t back off,” McReynolds said. A nightmare arrived on Aug. 30, 2009, spouting fire and billowing smoke as it rampaged through vacant properties and neighborhoods in North Auburn. From miles away, onlookers could watch the cloud of thick white smoke growing in its move northward. Plumes of black smoke would emerge from the white cloud again and again, signaling another home and its contents, a car or an outbuilding, being consumed by the fire. The horror of the fire itself ended hours afterward when it stopped on a ridge at the edge of the Parkway Drive neighborhood. But the nightmare that arrived on so many doorsteps that Sunday afternoon has never left. Residents of some of those 63 homes report that the stress, the strain and the feelings of terror from that day remain. Some have a deep sense of loss. Others are angry at law enforcement and fire personnel. While many have rebuilt their homes or move elsewhere, they say it’s still a struggle to rebuild their lives or move on. “Everything starts at 14:22,” Joe Castelli said, showing a stack of Aug. 30, 2009, dispatch-log information Cal Fire recently handed over to him and other 49 Fire victims. Castelli said he and others haven’t been satisfied with both the direction the Cal Fire investigation has taken and are pursuing their own theory that arson wasn’t the initial cause. He’s combed the Web for photos of the scene he says even Cal Fire investigators have told him they haven’t seen before. He’s secured footage from TV stations and has confronted Cal Fire investigators at meetings. Castelli and his wife, Faye Williams-Castelli, lost all their possessions from their rented home and have since relocated in a house near Downtown Auburn. Williams-Castelli said she’s found solace in the painting she does. Castelli is combing film and documents, looking for clues to a fire cause that he suspects could involve a faulty electrical line. While Cal Fire officials say PG&E or its equipment were in no way responsible for the fire, Castelli said the work he and others are doing is about justice – not obsession. Chris Whitehead, a painting contractor whose losses included not only a house and his painting equipment, said that while he hasn’t dealt with bad dreams, the past year has been a hard one on him mentally. Now living in a rental house in Bowman and hoping to rebuild on his property near Highway 49 and Dry Creek Road, he’s dropped 47 pounds from a loss of appetite he blames on stress and a feeling he describes as “displacement.” Others the Journal talked to for this story also described similar feelings, akin to being on the brink of homelessness. “I’ve felt a tremendous amount of stress, depression and anxiety,” Whitehead said. A rodeo cowboy for 20 years, he lost all his saddles but his horses were saved and they’re being stabled elsewhere until he rebuilds. But Whitehead said he hasn’t been on a horse since the fire. “It’s been a very rough year,” Whitehead said. But Whitehead, with a sense of humor enough to laugh off his weight loss as “the only thing good about the fire,” is also thankful. “The Auburn community has been great with both material and emotional support,” he said. On the day of the fire, Genetta Ison had seen the billow of smoke moving toward her Parkway Drive neighborhood house and was able to evacuate her husband, who was recovering from a stroke at the time, and her daughter, who has multiple sclerosis. Ison said the last thing she remembers seeing was her deck starting to catch fire but she didn’t look back as she left. Ison’s husband suffered a major stroke a month after the fire that she attributes to the stress of their plight. Her daughter, 51, is in a wheelchair. Ison said her condition has also worsened and while it’s difficult to tell with MS, she feels her daughter’s reaction to the terror of helplessness she felt that afternoon played a role in creating a higher level of stress. “If stress gets to you, it does bad things to you,” she said. Ison said that she has been able to keep on track emotionally by continuing to not look back. The family is back in a new house that is more fire safe than the old one. “The main thing is you deal with it,” Ison said. LODD Memorial day: Los Angeles County Fire Dept. 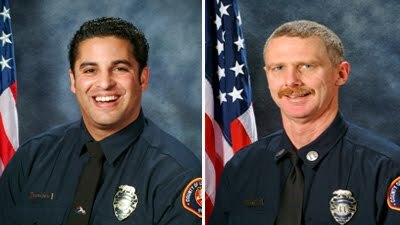 Captain Tedmund “Ted” Hall, 49, and firefighter specialist Arnaldo “Arnie” Quinones, 35, were killed near Mount Gleason (Camp 16) in the Angeles National Forest south of Acton on this day in 2009. Join us to pause, remember and honor all of fire fighters and first responders who have lost their lives in the line of duty. Each was a hard working individual who believed in what they were doing and were steadfast in their dedication while protecting and serving their community. This time last year, Los Angeles County Fire Dept. Captain Tedmund “Ted” Hall, 49, and firefighter specialist Arnaldo “Arnie” Quinones, 35, were killed near Mount Gleason (Camp 16) in the Angeles National Forest south of Acton. Their emergency response vehicle went over the side and fell 800 feet into a steep canyon amid intense fire activity while they tried to battle fast-moving flames on the Station fire. Critical Fire Weather pattern for most of the west today with Red Flag Warnings for wind, RH and dry lightning. Cooler temperatures are forecasted for this weekend and should moderate wildland fire behavior and growth. SBNF Lightning Fires - Lightning from thunderstorms across the San Bernardino National Forest on August 26, sparked several small lightning fires. There is no immediate threat to residents in the local mountain communities and no road closures due to these incidents. All fires are less than 1 acre in size and may be confined to a single tree or small area of ground fire. This was made up of 4 fires. Curry Fire - SCU - 375 acres is 90% contained. Full containment today. located on the west side of the WEST FIRE. Indian Fire CA-LNU - 363 acres, 90% contained. Blackburn Fire (CA-KRN-024656) 125 acres, 100% contained. This incident transitioned to a Type 3 Organization (Nunez, IC) today at 0600 hrs.Fire is located near the community of Pozo in northeastern San Luis Obispo County is now 100 percent contained. The cause of the fire remains under investigation. Turkey Flat, Friis, Navajo, La Panza and Navajo Flat recreation areas were impacted by the fire and will remain closed until further notice. The fire burned in dormant brush, hardwood slash, grass, brush and oaks. Ninety percent of the area affected by the Pozo Incident also burned during the Highway 58 Fire in 1996. One hundred seventy-five personnel remain assigned to the Incident. Also on hand are one helicopter, one fixed wing aircraft, five dozers, nine water tenders, three crews and 13 engines. By the end of today, the majority of these resources will be released. The Sheep Fire in Kings Canyon National Park has grown to 2425 acres based upon an infrared (IR) mapping mission August 24. The fire is visible in Cedar Grove. However, there are currently no threats to life or property. The park and the Sequoia National Forest are in unified command of the fire. Fire growth has been predominately along the southern and western flanks. Resources include the parks' Crew 91, Helicopter 552, Engine 51 (Grant Grove), and Engine 72 (Ash Mountain). Sequoia National Forest's resources include Crew 20 and Crew 2. Additionally, three helicopters have been ordered to complete water drops along the western flank. This is in an effort to slow the fire's western growth and reduce smoke impacts. Cooler temperatures are forecasted for this weekend and should moderate fire growth. Indirect fireline (away from the fire's edge) has been constructed on the forest to tie in the fire's western and northern edge to keep fire out of Lightning Creek drainage. Several spot fires over the Lookout Peak Ridge fireline have been handled by crews. Management: Unified Command: California Interagency Incident Management Team 4 and Kern County Fire Department Cooperating Agencies: Bureau of Land Management, California Highway Patrol, Kern County Sheriff. Fire Status and Today's Actions: Minimal fire activity was observed last night. This allowed crews working throughout the night to continue to make excellent progress constructing fireline and mopping up to ensure that no hot spots remain up to 100 feet inside the fire perimeter. This work will continue throughout the day today. High temperatures are expected once again today, with afternoon thunderstorms expected over the fire area. Firefighters working in these extremely hot and dry conditions are taking precautions to avoid dehydration and other heat related illnesses. As containment efforts continue to be successful, personnel and equipment are being demobilized from the fire and made available for other assignments. Evacuations and Closures: No evacuations are in place at this time. All schools that were previously closed in the fire area will re-open today. 3 Tall Grass (2.5 feet). Minimal fire activity, isolated free burning, creeping and smoldering. Continue line construction, mop up patrol. Management of the fire has transitioned to a unified command between CIIMT4 and Kern County Fire. Incident commanders are (Team 4) Rocky W. Opliger and (Kern County) Brian Marshall. Schools will reopen today. The incident is releasing critical resources to other fires. Fire officials have ordered evacuations for the Lebec Oaks Road and Chimney Canyon areas. 1545hrs - DC10(T-910)on-scene and making drop, LAC forming ST 1106A enroute.1530hrs - 1200 acres and 100 structures threatened. At approximately 12:15 firefighters from Kern County Fire Department, Bureau of Land Management, and the US Forest Service responded to a report of a wildland fire. The fire is located in Lebec and is actively burning. Residents are currently being evacuated with many structures threatened by this wildfire. Evacuees are being sent to Fraizer Mountain High School. Approximately 120 firefighters are aggressively fighting this fire with the assistance from helicopters and other aircraft. Approximately 750 acres burned. WX: High temps, light wind gusts steep terrain with heavy vegetation and grass. CBS/KCAL will be featuring a special story “The Station Fire – The Inside Story of Camp 16.” The story will honor the memory of Captain Ted Hall and Fire Fighter Specialist “Arnie” Quinones and highlight the heroic actions of the 13 other Department members who valiantly saved the lives of over 60 individuals who were at Camp 16 when the Station Fire overran the facility. The show will air tonight on Channel 2 at 11:00 p.m. and again tomorrow, August 24, 2010, on Channel 9 at 12:00 noon. If you have any questions, please contact the Public Affairs Unit at (323) 881-2472. LA CANADA FLINTRIDGE, Calif. — City officials Thursday unveiled a plaque honoring the firefighters and sheriff's deputies who responded to last year's massive Station Fire. Officials credited the hard work and skill of those first-responders for keeping the county's largest wildfire in history from destroying any homes in La Canada Flintridge. "After the Station Fire, we realized how fortunate we are," City Councilman Gregory Brown said. Firefighters "were instrumental in saving our community and other communities," he said, while also thanking deputies for protecting lives and property during the blaze that ultimately scorched more than 250,000 acres in the Angeles National Forest. The fire, which started last Aug. 26, destroyed 90 homes. Two Los Angeles County Fire Department firefighters, 47-year-old Capt. Tedmund "Ted" Hall and 35-year-old firefighter Specialist Arnaldo "Arnie" Quinones, died battling the blaze. "The bottom line here today is just to say thank you, thank you, thank you," Brown said at the unveiling of the plaque mounted on a small boulder at Memorial Park. County fire Assistant Chief Bill Niccum, accompanied by Cpt. David Silversparre of the sheriff's Crescenta Valley Station and a handful of deputies and firefighters, accepted the honor. "We would like to thank the city of La Canada Flintridge and its people for their generosity and kindness extended toward the first-responders," Niccum said. "Our goal is to protect lives and property, and the city has been a great partner." The outpouring of community support for firefighter and deputies continued long after the fire was 100 percent contained Oct. 16, Niccum added. He also took a moment to honor Hall and Quinones. Councilwoman Laura Olhasso said the plaque represented "a little bit of closure to that horrible week" when the blaze burned near La Canada Flintridge. Niccum said foothill residents now need to prepare for another fire season, encouraging them to follow his department's "Ready, Set, Go!" wildfire action plan. The plan involves clearing brush around homes; having a family evacuation plan; and quickly heeding evacuation orders. Niccum said he understands that evacuating and leaving their homes behind is difficult for residents, but it's vital for public safety. CA-MVU-SANTA - 1751hrs 1144 - Humans remains found, probably couple years old. CA-MVU-SANTA - 1751hrs 1144 - Humans remains found, probably couple years old. sending proper resources. CA-MVU- SANTA -1753 - Forward progress has been stopped, 30acres, 50% cont. per IC, #ICP north end of Casino parking lot. Significant events: Incident is merging from state to federal command. Planned actions: Aggressive fire suppression tactics to include direct line construction. Fire Behavior: Multiple spot fires with rapid rate of spread. Evacuations: Campgrounds nearby have been evacuated as a precaution, including Navajo Flat and Turkey Flat. 2000hrs- ANF Helitanker 746 assigned and departing for the incident Sunday morning at 0700. ST 5650C From SQF(SQF Engines 21,22,41,44, and 46 ) En Route. 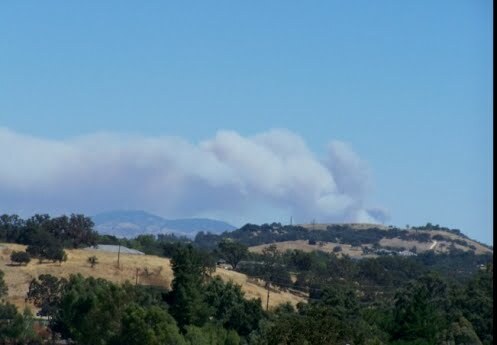 1900hrs- OSCC News and Notes: Pozo Fire CA-SLU-006481 2,500 acres and 10% contained. Fire is under unified command with SRA & FRA. Smiths Central Coast IMT team will assume command of the incident at 0600 Sunday. 1800hrs- 2,500 acres and 10% contained.Vandenberg Hot Shots ordered up, Smith River IHC is also shown as ordered, ST9410C and ST9418L en route from TUU, ST9420C from MM. 1700hrs- Jim Smith's Type 2 IMT on order in ROSS, no immediate structure threats. 1315hrs- 2 LPF engines dispatched to assist, 3 additional type 3s. 2 crews and 2 dozers..
1300hrs- 25 to 30 acres with spotting full Cal Fire and LPF response can see large header from Paso Robles. Fire behavior: Fire is developing well-defined convection cloud structure churning and rotating up off the fire which is now clearly climbing the shoulders of Black Mountain which contains an FAA radar facility. This entire area last burned in the 1996 Highway 58 Fire at 106,668 acres. Resources: Major resource order shown is ROSS: Pending:12 type 1 HC, 5 type 1HC S/T, 5 Type 3 Eng S/T, 10 Doz S/T, 8 Water Tenders. The El Monte fire started at 1:00pm on Saturday, August 21, 2010 at the edge of El Monte Park in Lakeside, in San Diego County. Steep slopes and light, flashy fuels contributed to rapid fire growth to an estimated 2,000-2,500 acres. Once an aerial overflight using GPS technology was completed, the acreage was corrected to 1,047 acres within the fire perimeter. Fire was in unified command with US Forest Service, CAL FIRE, Heartland Fire Agency, Bureau of Land Management, Lakeside Fire, and Barona Fire. As of 0600 Sunday, August 22, 2010, Southern California Interagency Incident Management Team 1 will be assuming management of the incident. Closures include: A Residents-only closure at the intersection of El Monte Rd and Lake Jennings Rd. Both El Monte Park and El Cap Reservoir. The spread of the fire has been stopped. Improved mapping updates the acreage to 1,047 acres. The Incident Commander is beginning to release some of the firefighting aircraft. CAL FIRE is in unified command with the Cleveland National Forest, but a USFS Management Team will take over at 9 p.m.
Evacuations: El Capitan Reservoir and El Monte Park was evacuated for precautionary reasons; there is still no threat to structures. 10 people have been evacuated by Sheriff’s helicopters - Cal Fire reporting that eight persons who were hiking on a peak of El Cajon Mountain, potentially in the path of the fire, had to be airlifted off the mountain to safety and two residents. Injuries: 2 minor firefighter injuries reported. Conditions: AA states conditions ripe for a major fire, now established on El Cajon Mtn, which last burned in 2003 Cedar Fire. Terrain: Steep, rocky and heavy grass load. Limited ground access, due to roads in area not maintained since 2003 Cedar rehab. 1900- Fire acreage revised 1,047 acres - 10% after mapping flight. 1800- The spread of the fire has been stopped. 1700hrs- 2,000 acres 5-10% contained. IC ROSS request for CDF/USFS ST specific due to two separate extensive hose lays from the valley bottom to the top of El Cajon Mnt. 1525- large commercial pipe storage yard on fire with ABS, PVC etc at base of dam putting up large column black smoke.1515- Three CNF Hotshot crews released from ANF, being ordered for day shift tomorrow. AA concerned fire could spot across the lake to the east if the head can't be slowed. Air Ops: Current priority is northface of El El Cajon Mtn, with Lead-Bravo 5 assisting AA and H-301 as HELCO. 1510 - Div. 4 states acreage now in excess 1500 and running. 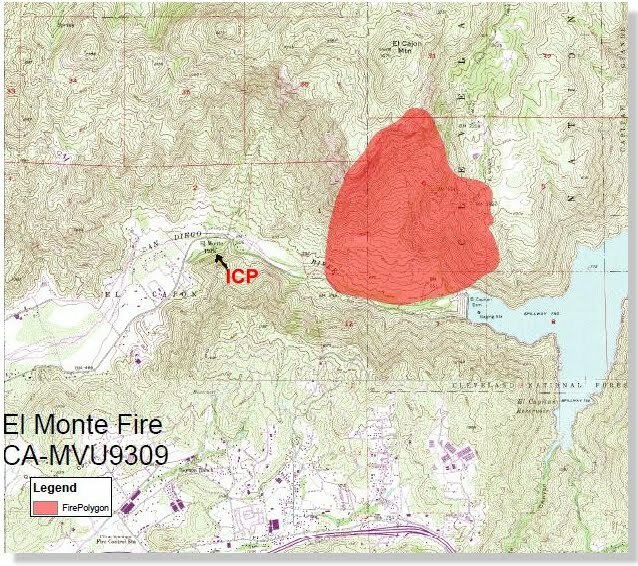 CNF requested a Type II IMT, ICP to be set-up at El Monte Co. Park. 1415- 300+ acres. Starting to spot ahead of itself out near the dam. multi Injuries reported ALS ordered. 1345- Starting to burn onto the forest, Per IC fire is over 50 acres, rapid rate of spread. Burning North of El Capitan Rd. towards the East. Ordered up 1 Type one ST Immediate need 5 closest type three engines. 1320 - Structures threatened with some residents cutoff from evacuation. 1330 - AA330 size up , 10 acres , potential for extended attack , ordered 4 additional tankers and 3 copters, structure fire into the veg , CNF now has a full response going and unified command. Location: North side of El Monte Road, east of the community of Lakeside, fire started at base of El Cajon mtn in the flats. Resources: Three CNF Hotshot crews released from ANF, being ordered for day shift tomorrow. AA-330, T- 70, 72, 73. C-12, C-10, H-538. 301 and HT-781 enroute from Hemet. Saturday - Just do it! - Truckee River - 60 foot Rope Swing! Think you got big ones? 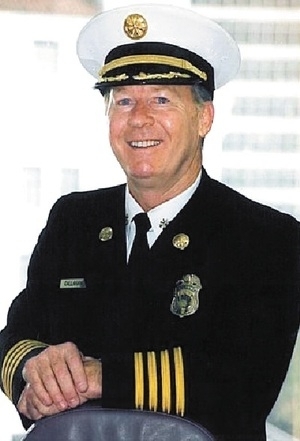 Firefighters were saddened to learn of the sudden passing of retired LAFD Deputy Chief and current San Luis Obispo Fire Chief John W. Callahan on August 18, 2010. Friends and colleagues of San Luis Obispo Fire Chief John Callahan remembered him Thursday for his wisdom, humor, leadership and ability to bring a sense of calm to difficult situations. John Callahan, the San Luis Obispo Fire Department chief, died suddenly of a heart attack Wednesday. He was 61. Callahan was appointed chief in 2005, after 32 years in the Los Angeles Fire Department, where he retired as a deputy chief. He was expected to retire from the San Luis Obispo Fire Department in November. "He was a very senior and experienced fire chief," San Luis Obispo Mayor Dave Romero said. "I think he did an excellent job while he was here. He was very stable, very knowledgeable and everybody liked him.Romero said Callahan had the heart attack while playing softball. City Manager Katie Lichtig, also a member of the team, said the game was being played at Santa Rosa Park. Callahan was second baseman, she said, of a team that was comprised of city employees. Callahan was rushed to Sierra Vista Regional Medical Center in San Luis Obispo, and Lichtig and her predecessor, Ken Hampian, were among of group of city officials who followed. Hampian hired Callahan to the job in San Luis Obispo, and said he was "such a strong person and strong force within the city family. It is just hard to absorb that he is gone. "He was just a wonderful fire chief, leader and friend to all of us." Lichtig called Callahan "an amazing collaborator with all the other departments (in city government) and was very involved with the community, which is another indication of how much he loved serving the community of San Luis Obispo." Callahan said when he joined the department that he was impressed by San Luis Obispo's sense of community, and wanted to get local groups and businesses involved. When he was sworn in, he told The Tribune in 2005, "half of the Fire Department showed up." Callahan was credited with leading improvements to the city's Emergency Operations Center ­ a central command post for all city resources during disasters. He was involved in the YMCA and the Rotary Club of San Luis Obispo de Tolosa. Callahan, who died Wednesday of an apparent heart attack, was looking forward to spending more time with family and on community activities once he retired in November exactly five years after he was appointed to lead the department. President Barack Obama came out in favor of the 9/11 health bill on Wednesday. A few emails have come to us about the issue of the proposed Mosque in NYC near the WTC Ground Zero site. Of course, some of you may get annoyed that we have an opinion and will claim it has nothing to do with our "mission" on TSL and/or The Secret List. That's ok, once in a while we will give editorial opinion on "related" items to Firefighter well being as we have since we started TSL in 1998. Some newer members of The Secret List may not be aware of that, as we don't do it very often. However, every once in a while, our opinion comes to you, at no cost, as a part of The Secret List benefits package. How lucky you are. In this case, sure, we have an opinion on the Mosque issue. In our opinion, it is not an issue of religious freedom as the great majority of Muslims (like most people of all religions) are peace loving and are absolutely entitled to religious freedom as citizens of the United States of America. And, they, like all Americans, enjoy and demonstrate that freedom each and every day, as they absolutely should. However, it is an issue of respect for those murdered on 9/11, specifically at the WTC. That is the issue. If the proposed location upsets those directly affected, the survivors and relatives of those murdered on 9/11, simply respect their wishes and work with them on a better solution. It's not a religious freedom issue, but one of deep respect. Our opinion. Now-since we have opened that can of worms, we will offer another opinion directly related to 9/11/01. Instead of the many politicians who are all worked up and grandstanding this issue, including The President, how about spending HALF that energy and HALF that press/media time focused on cleaning up and PASSING the James Zadroga 9/11 Health and Compensation Act. Firefighters, EMT's, Police Officers and Civilians who are in the process of dying with less than adequate protection desperately need that support, and it is shameful what has happened to it so far. Everyone and their brother, including political big shots, from Pres. Obama to Ex-Gov. Palin, have an opinion on the Mosque issue, but where are they on the ZADROGA BILL clean up and passage? To the Federally elected officials, including some who subscribe to The Secret List, the best use of energy related to 9/11 at this point would be to clean out all the bi-partisan junk that's been added to pollute that bill and then support it, across both parties. The folks who worked at Ground Zero need your help, urgently. Unfortunately, but not surprisingly, the "9/11 bill" is being used to gain political advantage by some members of both parties. Firefighters, Police Officers, EMT's and others who worked on the pile are being used as pawns. If those who responded to 9/11 and those who participated in the cleanup continue to suffer, the Washington politicians appear to just consider that unfortunate collateral damage in their own political war. Incredible. If you feel strongly about what we are writing, don't tell us. HOWEVER, every member of Congress should hear how you feel and, as far as we are concerned, they must put politics aside, clean up and PASS the "Zadroga 9/11 Health and Compensation Act". Get rid of all the added unrelated political crap that's in there and pass it with 100% of the bill focused on helping those who are sick from simply trying to help at Ground Zero. Ya thinking they can't do that, and do it quickly? BS. If they want to, they can. If they want to. Today it's the Firefighters, Police Officers, EMT's and civilians in NYC, tomorrow it may be somewhere else. Perhaps you and your FD will be directly affected when the next attacks come. Every Firefighter in the USA has the potential to be the next victim of terrorism. As FDNY, NYPD and others were on 9/11, you may be the "soldiers" who do the domestic fighting next time. This definitely does impact FF survival. Religious freedom? FAILURE to provide compensation to our ailing Firefighters, Police Officers, EMT's and civilians could be an issue of religious freedom, a failure to hear and answer their prayers, by those who COULD answer them (Congress), if they wanted to. Please take action TODAY as you have a chance to help those who are "praying" for the passage of this bill-so they may have a chance at a better quality of life. Perhaps we can answer their prayers, no matter what their religion. September 11th is less than two months away. What are the plans at your FD for your September 11th Remembrance Ceremony? What are the plans in your community for the September 11th Remembrance Ceremony? "Billy was outside the wrought-iron fence and my husband, John, threw a toy over the fence and into the pool. Billy went through the vertical wrought iron fence into the pool to retrieve that toy. Yes, Billy yelped as he shoved himself through, but through he went and he was one happy critter because he had the toy. Billy simply had to have a toy. If there was not a toy available, Billy would find one. Be it a bush, a rock, a plant... you name it, it became a toy if there was nothing else." In November 1998, Billy was paired with Mike Scott, an 18-year veteran with Heartland Fire & Rescue. Though Mike's work included ten years with the Federal Emergency Management Agency (FEMA) Urban Search & Rescue Task Force, he had yet to try his hand at being a canine handler. After watching a fellow firefighter work with a dog from SDF, Mike called to inquire about becoming a handler himself and quickly found his true calling. Mike and Billy quickly formed a solid bond as Billy went to work with Mike and spent countless hours training for the moment they would be called upon to serve their country. That moment came all too soon when they were deployed for seven days to the devastating scene of the terrorist attacks on the World Trade Center on September 11, 2001. “We were scheduled for 12 hour shifts," Mike recalls, "but in reality they were 16 to 17 hour days because of the briefings, travel time, and other logistics. There was steel everywhere and lots of sharp objects... really rough terrain, so we had to let the dogs negotiate it on their own and search independently... the terrain really slowed them down but the dogs searched very well." When Mike and fellow SDF Handler Steve Swaney returned from New York City, they realized that although teams must continually train even after becoming certified, even dogs with Billy's expertise do not have the opportunity to train for a disaster as large as 9/11. This led the two handlers to recommend to SDF that an annual workshop exposing the dogs to unusual conditions to test how well they work when facing a disrupted routine would be incredibly beneficial. Mike and Steve’s suggestion is what SDF handlers now know as the annual IronDog competition, testing the deployment readiness and advanced search skills of SDF’s Certified Canine Disaster Search Teams. In addition to their deployment to the World Trade Center attacks, Mike and Billy also responded to a landslide and retaining wall collapse in San Diego in June 1999 and the Torrey Pines Bluff collapse in December 2004. Mike and Billy served America together as a FEMA Certified Canine Disaster Search Team for six years and Mike shared that even in retirement, Billy’s eyes would still light up at the sight of a toy! During his retirement, Billy had increasing difficulty moving around and sadly, on August 16, 2010, Mike could no longer watch his partner of twelve years suffering – Billy crossed the Rainbow Bridge with Mike by his side at the veterinarian’s office. Even in his darkest moment, Mike still saw the good in what he and Billy had done and the canine program that they had helped build. In an email to SDF, Mike shared, "I am so proud to have had the chance to experience the reward of having a search dog and the chance to be a part of NDSDF." We were proud to have the chance to work with a great Search Team like Mike and Billy and know that Billy will be greatly missed by all who knew him. RICHMOND, Calif. — Two Richmond firefighters were treated for minor injuries Wednesday morning after a blaze consumed part of a home on the 500 block of Maine Avenue. The fire broke out a little before 7 a.m., Battalion Chief Merlin Turner said, after the occupant started breakfast in the kitchen, then took a shower. "When he got out he found the house full of smoke," Turner said. He escaped unhurt. Fire crews extinguished the fire, which caused about $65,000 in damage to the house and its contents. and called the American Red Cross to help the victim with temporary shelter. One firefighter hurt his back, while another got debris in his eyes, Turner said. Both were treated, and the department expects both will recover. The 2010 California Firefighters Memorial Ceremony is quickly approaching. All California fire department honor guards and pipe and drum bands are invited to participate in the ceremony in Sacramento on Saturday, October 16th, 2010, at 11:30 AM. Any honor guard or pipe band wishing to participate in the memorial ceremony must attend the mandatory meeting and practice on Friday, October 15th, 2009. Please see below for specific rehearsal times. Friday, October 15th, 2010 -- 10:00 AM at the California Firefighters Memorial site in Capitol Park. All experienced pipers and drummers are welcome to participate, but you must know the music. Click here for copies of the sheet music. Friday, October 15th, 2010 -- 1:00 PM at the California Firefighters Memorial site in Capitol Park. Assembly will begin for all honor guard and pipe bands at 10:30 AM on Saturday, October 16th on the South Steps of the State Capitol, a short walk from the California Firefighters Memorial site. Note: Breakfast burritos and coffee will be served from 9:30 to 11:00 AM for all honor guard and pipe bands marching in the procession. If you are interested in participating, please email rsvpmem@cpf.org. Check memorial.cpf.org for more details on the ceremony. John Callahan, the San Luis Obispo Fire Department Chief, died suddenly of a heart attack Wednesday. Operation Iraqi Freedom: Last combat brigade has left Iraq. OIF - 0340 #Iraq time the last combat troops crossed the border into Kuwait, combat operations have ceased, the war is over! Photo credit: Maya Alleruzzo - AP/MSNBC. Working with the Government of Russia to outline a comprehensive U.S. response to the severe, forest fires in the Russian Federation, several U.S. government agencies are working to provide relief supplies. This includes equipment to bolster Russia’s fire suppression efforts, such as water tanks, pumps, hand tools, fire-protective clothing, and medical kits. As well, a monetary donation to the International Federation of Red Cross and Red Crescent Societies will help provide relief items, such as blankets, bedding, and food parcels, for some of the people who lost their homes in the fire. In addition, the State of California, which frequently suffers from forest fires, is donating fire-protection clothing, which was identified as a critical need by Russian firefighting authorities. This brings total U.S. assistance to approximately $4.5 million. Since late June, Russia has baked in unusually high temperatures, often reaching 40 degrees (Celsius). The heat wave is unprecedented in 130 years of Russian record keeping, and has sparked thousands of peat and forest fires, most of them in western Russia. The resulting smoke has settled like a blanket of poisonous smog over Moscow. At the height of the crisis, 700 Muscovites were dying daily. That's double the city's usual death rate. Because U.S. and Russian forests share similar plant and animal species and face similar threats, 2 two countries have been working together to protect the world’s largest forests for more than 50 years. Under the auspices of the U.S.-Russia Bilateral Presidential Commission, the Federal Emergency Management Agency Administrator, Craig Fugate met his counterpart in the Russian Emergencies Ministry this July as part of a 14 year effort to strengthen our joint capacity to respond to such natural disasters. The U.S. departments of Agriculture and Interior, also, have a long history of exchanging information and technical expertise with Russian forestry and firefighting agencies in such areas as firefighter training and wildfire behavior. This disaster highlights the need for continued and expanded cooperation in both of these areas. During a telephone call to Russian President Dmitri Medvedev, President Barack Obama expressed his deepest condolences for the tragic losses that Russia has suffered in the recent wildfires, and extended an offer of help. "We are taking action to support the heroic efforts of Russian firefighters and emergency responders as they seek to bring these fires under control," said President Obama. "The United States stands with the people of Russia as they fight to contain the destructive spread of wildfires." Washington, DC, July 22, 2010 – Patriot Technologies Group (PTG) is pleased to announce the completion of a full mission profile demonstration of our Multi-Mission Aircraft (MMA) to Fire Chiefs representing the Ventura County, CA Fire District yesterday. “We are happy to have had the opportunity to illustrate the important situational awareness tools our Multi-Mission Aircraft can provide for airborne fire support,” said PTG CEO Dan Caine. “Every year hundreds of brave firefighters risk their lives for us fighting incredibly complex fires in California. We care deeply about the sacrifices that they make and believe our aircraft will provide the firefighters and their leadership greater real-time situational awareness, and help keep our firefighters and communities safe,” said Caine. PTG’s Multi-Mission Aircraft (MMA) is a revolutionary, affordable, airborne mapping and aerial support vehicle for clients. PTG’s MMA is an extraordinarily capable technology focused system, packaged on a very economical single-engine fixed-wing aircraft. The retractable EO/IR camera ball and on-board mapping system allow the two-man crew to quickly generate precisely geo-registered maps of the fire perimeter and hot spots. These “shape” files are immediately available to GIS personnel on the ground through in-flight cellular and line-of-sight downlinks. The system can also precisely measure flame height and surface area, as well as transmit live video to battery powered, hand-held receivers that are provided with the PTG service. PTG’s MMA can provide real-time streaming video, near real-time pictures, perimeter map and shapefiles, all designed to assist incident commanders with key and time critical decision making information. Experienced aviators and TFOs that have flown on multiple fire missions will control PTG’s MMA. This aircraft will provide Ventura County Fire District and other Departments and Agencies greater real-time situational awareness and help keep our firefighters and communities safe. PTG is a leading homeland security firm. For more information - www.ptgllc.com. Budget cuts in Alameda have shuttered a fire station and resulted in the layoffs of firefighters, but the town's $195,702-a-year fire chief is getting unlimited free fill-ups for both his BMW convertible sports car and his Honda pickup truck at the city pump. Disgruntled firefighters caught Fire Chief David Kapler on camera over the weekend taking advantage of the perk and forwarded the photos to Mayor Beverly Johnson - who promptly called the vacationing city manager for an explanation. "In my opinion, it was a very inappropriate thing to do," the mayor said of Kapler's habit of filling his cars with gratis gasoline. Kapler, however, says it's no secret that he regularly gases up his personal cars at the city pump. He says the free gas is part of the deal he cut with then-City Manager Debra Kurita when he signed on as chief in 2007. "Since I don't drive a city vehicle," Kapler said, "I was given the option to drive my own vehicle and to have access to city gas for all my vehicles for my personal use." Maybe, but Kapler's contract doesn't actually say anything about fueling up for free. "It is not in there," Karen Willis, the city's human resources director, told us after looking over the agreement. "Whether there was some other understanding, I don't know." The contract does state that given his round-the-clock duties, the chief is entitled to a $250-a-month car allowance if he uses his own car "for 'on call' responsibilities." Dom Weaver, president of the 86-member Alameda Firefighters Association, which is battling the city over a new contract and voted "no confidence" in the chief last year, said, "I'm shocked and disappointed this is going on, especially in light of the current conditions we're facing." However, it should be noted that it has been going on for years - with the chief often filling up at a pump right next to the firehouse. Seems no one cared all that much - until Alameda hit on hard times, laying off three firefighters and scrapping 15 unfilled positions 15 months ago. Johnson, however, said she hadn't known about the chief's free gasoline until firefighters showed her the photos Tuesday morning. "The city manager wasn't aware of it, and I am sure she will conduct a full review of what has occurred here," Johnson said. A wildland fire is burning on the northern edge of Lake Silverwood, north of Crestline. There are no threats to residents in the local mountains or Summit Valley area of Hesperia. All highways are open and no evacuations are in place. IA: 1705hrs - Wildland Fire - Cal Fire and BDF responding to Silverwood Lake State Recreation Area, Hesperia, Smoke showing from Strawberry peak lookout. Sizeup: 1.5 ac mod rate of spread. heavy fuels, Fire was very active during initial attack. Location: In the Miller canyon areaof Silverwood lake. There are no threats to residents in the local mountains or Summit Valley area of Hesperia. 1915hrs - IC just order 3 more water tenders closest available. 1830hrs -Helitanker 781 inbound from Hemet, Heli 534 also assigned. 1800hrs -Helitanker 716 returning to San Bernardino tanker base reporting issues with his tank. IC reporting fire making a run to the east - 25-30 acres, potential for another 10-20. No structure threat. 1745hrs - Lead Bravo 5 ordered out of Fox. T05 and T73 currently enroute, will be loading out of Victorville. Order is in for 2 additional ATs and 2 HTs. 1735hrs -25 acres holding on a ridge, AA12 on scene.